This summer, a couple of our friends left Bermuda to repatriate back home to Canada. Their summer was going to be consumed by their wedding, a three month honeymoon to various many countries around the world & finally settling down in Canada at the end of the year. All good stuff. So, it was during the summer that we were helping our friends transport some of their belongings to be shipped, ones they could not bear to leave behind on the island. We made way for the Cargo Terminal at the Airport & for anyone that doesn't know, this is where you go to if you were to send or receive any shipments. We arrived closer to the lunch hour. Definitely the wrong time to get any sort of personal shipping done, as the cargo area was abuzz with Bermuda's businesses waiting in line to pick up their shipments. Ev erything from perishables food items to flowers from Holland to non perishables were slowly being carted out & deposited into the appropriate vans. And so while we waited our turn, our attention turned to the little cargo that had just been deposited at the entrance, awaiting pick up. Baby Chicks! A few hundreds of them chirping away, waiting to be let out no doubt. After a few inquiries we found out these were destined to roam the island to fulfill their destiny as free range chickens. What happens to them once they're grown is another story. But hey, at least they get to reach adulthood (they've probably grown by now). I managed to get a closeup shot with my camera phone. Adorable, aren't they??? Fast forward to a couple of days ago when said friends posted one of the following pics on their album from their ongoing three month honeymoon. Taken in Thailand, this picture is heartbreaking. Inhumane, insane, disgusting are some of the other words I could use to describe it as well. It's a dish of chickens but not the kind you would expect. BRACE YOURSELF! It's a dish of baby chicks that were apparently deep fried, but first thrown in alive. If you're brave, then go ahead & click on the picture. Of course, our friends were just as disgusted. How on earth can anyone eat baby chicks? Are these people blind? Do they not see how adorable baby chicks are? And what I can't understand is, with Thailand being agriculturally blessed with abundant fertile land, is there really a need to resort to the kind of food shown & mentioned here. Apparently, deep fried maggots were al so on the menu. Circle of life! Or maybe a case of vengeance? That's all I'm going to say about that. What on earth are they eating over there? 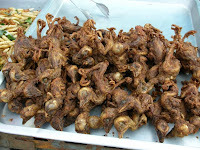 My parents visited Thailand way back when & never said a peep about this sort of cuisine. Perhaps I should ask again since they may have wanted to spare us kids unnecessary grief. And according to our friends, China is not any better (worse in fact) & I am loath to go into any details, but I will say this: Sometimes you hear about these things offhand, but are reluctant to believe it, just because it sounds unbelievable. Well, not anymore, here are pictures & first hand experiences to prove this. I enjoy your blog! It is nice to see we are not the only crazy people that threw in a wedding, honeymoon and move back to Canada into a short period!! My husband and I did the same thing (sans Thailand!) in the summer as well. It was hard to leave Bermuda but worth it in the end! I won't be vacationing in Thailand or China. 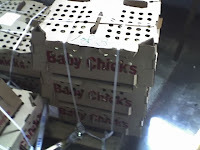 I was going to say that I loved the cute little chicks in your BDA Airport photo! Thanks Anon. I don't think I could cram a wedding in all with moving & vacationing & I don't know how people do it. And yes I often wonder what it is about Bermuda that I am going to miss the most when I leave. Perhaps the water, the weather & the minimal income tax. BermudaBluez: Yes I love that baby chick pic as well. Suprisingly it came out quite well, for a camera phone. Thanks! Oh and you can vacation in Thailand & China, just plan to live on Kelloggs & Vitamins. Ha ha...she is so right...we also bought a house during this period and had 5 girlfriends visit (as you remember I am sure) a month before leaving the island! I never would advise someone to plan a huge wedding, pack-up and sell all belonging to move from Bermuda to Canada, get married, plan and go on a 3 month honeymoon all in a very short period. VERY STRESSFUL! i did click on the thailand picture and was appropriately disgusted! Actually Thailand is the most vegetarian-friendly country in SEAsia, although it has more than a fair share of disgusting foods in this part of the world! Nice article worth reading. I forwarded the same to all of my friends made them aware of what’s happening in our world. 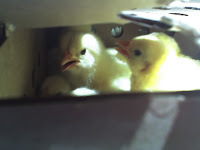 So what if they are small baby chicks they have a right to live. Thanks Bam Bam! You're so right...They do have a right to live!